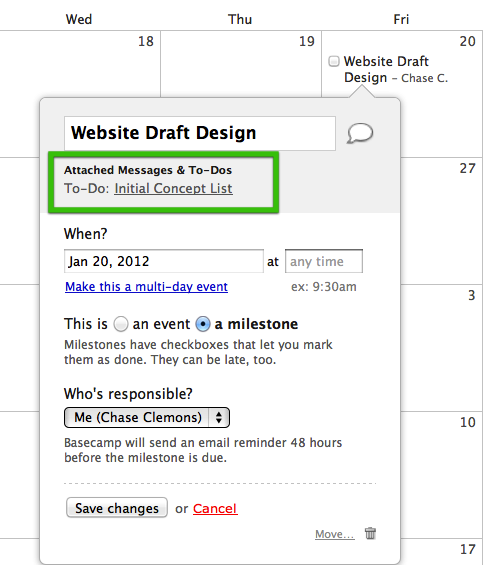 Basecamp Classic: What does it mean to relate a to-do list to a milestone? What does it mean to relate a to-do list to a milestone? When you relate a to-do list to a milestone, you’ll see a link to that to-do list displayed under the milestone on the milestones screen. 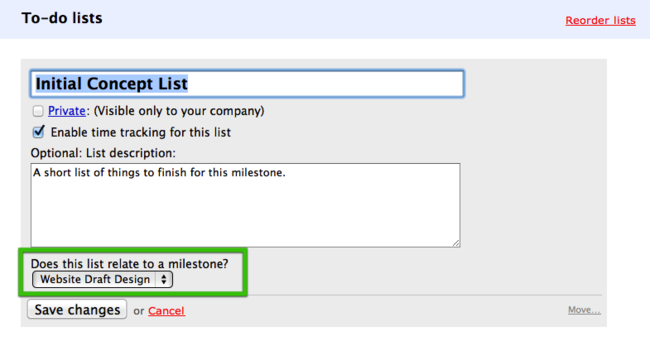 This allows you to see which to-do lists relate to a particular milestone. To relate a new list to a milestone, choose the appropriate milestone from the pulldown below “Does this list relate to a milestone?” You can also relate an existing list to a milestone too. Just roll your mouse over the list title and click on the red “Edit” link that appears to the left. Then select the milestone you want. Note: Checking off an item on the to-do list or completing the list entirely doesn’t automatically complete the milestone. The association is purely visual. You’ll still need to go to the “Milestones” tab and check off the milestone manually to mark it as done.